You couldn’t get much farther apart than Berkeley, California and Annisquam, Mass, but these two towns do have something important in common—a love of fresh, local food. 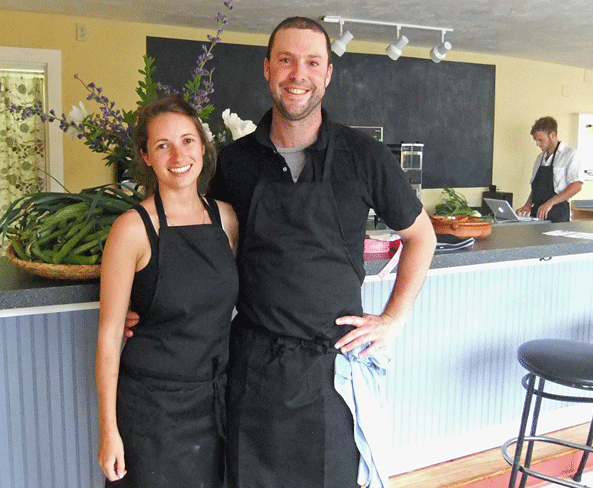 And now, they have something else tying them together: The Market Restaurant, owned by Annisquam native Amelia O’Reilly and Berkeley’s Nico Monday. Both recently moved back to the North Shore after more than five years cooking at Northern California’s famous Chez Panisse. They brought Monday’s brother, Oliver, with them to oversee the purchase of local produce and seafood. It’s no coincidence that O’Reilly and the Mondays arrived in May to set up their new restaurant. For one thing, the idea is to take advantage of the abundance of the New England summer—lobster and other seafood, locally grown fruits and vegetables, and people not wanting to turn on their stoves. For another, their restaurant license is seasonal (until October 15), although O’Reilly says they may hold cooking classes or offer catering out of the space during the winter. 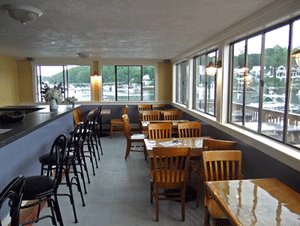 The restaurant’s space is small and casual but charming, with eight indoor tables and six outdoors, overlooking picturesque Lobster Cove. Starting June 4, dinner will be served nightly except Wednesdays; the menu will feature three entrees, three salads, and one or two desserts. For now, dinner service is BYOB, but a beer and wine license is in the works. The menu will change nightly depending on what seafood and produce are freshest and will include options like fish stew, fried scallops with homemade onion rings, and a vegetarian option. O’Reilly says they plan to serve meat only if it comes from a local, organic source. Starting June 5, breakfast will be served, starting with fritter-like sour cream donuts at 7:00 and full entrees at 7:30. Expect to see hearty fisherman’s fare like fishcakes, beans, and anadama bread (a local favorite flavored with molasses and cornmeal). On June 21, a picnic-style lunch service will begin with items like lobster rolls and fried fish sandwiches, perfect for taking to an outside table, the beach, or a boat. We were invited to attend the restaurant’s grand opening this weekend, where we sampled crispy brandade, lobster paella with aioli, and rocket salad with shaved fennel. Everything we ate was delicious—perfectly cooked and seasoned—a successful tying together of the traditional (brandade are fritters made with salt cod), the local, and the gourmet. The paella looked marvelous and tasted even better, with large chunks of lobster, mussels, clams, saffron flavored risotto, and the addictive aioli. It’s easy to get caught up in the enthusiasm of these three food lovers and their passion for local products. 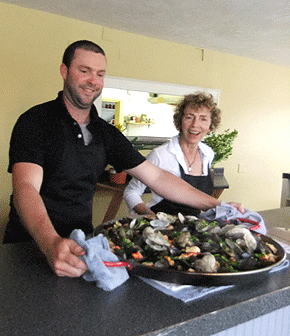 Seafood comes from Cape Ann Fresh Catch and other local purveyors and may, one day, simply arrive at the restaurant’s dock. Bread baskets will be filled by Salem’s A&J King, hot dog rolls are from Virgilio’s in Gloucester, and Oliver has posted a Google map showing North Shore farms that will supply the restaurant’s produce. Some greens won’t have to travel even that far—lettuce and herbs are already growing at O’Reilly’s mother’s house in nearby Lanesville. We can’t help but think that Alice Waters would approve.